You are currently browsing the The Pet Product Guru blog archives for the day Friday, March 30th, 2018. You were always told that cats hate water right? So you could never think that cats are able to swim, or can they? The truth is yes cats can swim. My cats were always fascinated by water, running water that is. Both of my babies would get in the tub and wait for me to turn on the faucet but that’s about it. One day, I accidentally turned on the shower and my cat Millie quickly jumped out of the tub. 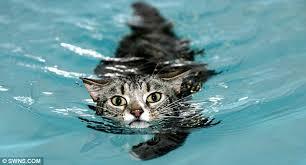 All domestic cats are born physically able to swim and they have an understanding of how to do this. When human babies are submerged in water, they automatically hold their breath, their heart rate slows, and circulation to their hands and feet decreases to stop them losing heat. The same goes for our feline friends. You may be asking yourself but why do cats hate the water? First if your born knowing how to do something doesn’t meat that you’re good at it. Some cats might have been bred for characteristics – such as a less muscular physique or a particular type of coat – which makes them somehow less suited to life in the water. Outdoor cats are more exposed to water like lakes, ponds and streams so they may be more acclimated to water than a house cat would be. Fear not, if a situation ever came up where your cat was submerged in water, his instincts would probably kick in and he would stay afloat. or listen on our website: Edgewatergoldradio.com. add comment Comments Off on Can Your Cat Swim?